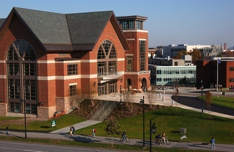 The University of Vermont (UVM) Davis Center was the first student center to receive LEED Gold certification for new construction from the U.S. Green Building Council. This cutting-edge, 186,000 square-foot building features a 19,000 square-foot green roof, built-in compost storage coolers, waterless urinals, and an energy efficient HVAC system. It diverts more than 60 percent of its waste from the landfill. In 2010, the Davis Center received the Innovative Achievement Award, sponsored by American Campus Communities. 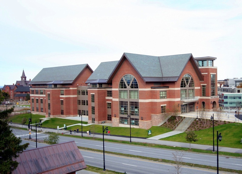 The Davis Center represents UVM's commitment to the environment and green building practices. Design Issue: Design called for constant volume energy recovery units (ERU), air handling units (AHU) and kitchen exhaust fans. Cx Associates recommended the use of variable air volume (VAV) fans in all three systems to achieve significant energy savings. Benefit: VAV systems were implemented in all HVAC and kitchen exhaust systems. This amounts to an estimated energy cost savings of over $58,000 per year of operation. Design Issue: The lighting power densities and foot candle levels in back of house areas were higher than necessary. Cx Associates recommended significant reductions in lighting. Benefit: By reducing the number of fixtures purchased, installation costs were reduced and the amount of energy needed to illuminate back of house spaces was minimized. Savings were estimated to be $5,000 in initial costs and $1,300 per year. Construction Issue: Carbon dioxide (CO2) sensor setpoints for indoor air quality control for all the AHUs and ERUs were originally programmed to maintain the interior space CO2 setpoints too low. Cx Associates recommended a programming modification to increase CO2 setpoints to more accurately reflect the ventilation requirements of the areas. Benefit: The energy saved by not heating or cooling the excessive outdoor air is over 227 million BTUs per year. This results in greenhouse gas reductions equivalent to removing 9 passenger cars from the roads for one year. If the energy came from electricity, the savings would amount to roughly $7,300 annually. Construction Issue: Numerous occupancy sensors for lighting control were found not installed during the commissioning process. This deficiency occurred throughout the back of house spaces. Cx Associates worked with the team to ensure the specified lighting controls were installed and functional. Benefit: Significant reduced lighting load energy savings resulted from all the occupancy sensors being installed. Construction Issue: Non-functioning lighting dimmers were found, and in some cases, not installed. Cx Associates worked with the team to ensure the entire dimming system was operational. Benefit: Lighting control in ballrooms and meeting rooms is fully functional providing the expected levels of amenity in these high profile environments. Due to these and hundreds of other commissioning recommendations, UVM cut both construction and operating costs, while ensuring that the performance of the building's systems matched the university's ideals. The result: a visionary building with systems that demonstrate UVM's commitment to meeting the challenges of a new century.